Snack bar, swimming pool, sauna. 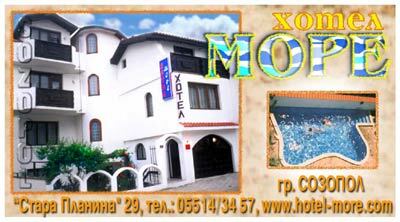 I just returned from Sozopol and my girlfriend and I had a very enjoyable stay at Hotel More. The owner and his family were extremely nice and helpful in every way. The rooms were cleaned and our beds were made everyday, as well as new towels. The hotel was also very quiet but is located only a few minutes walk to the main strip in the new town and the beach. On a scale of 1 through 10 on value, I'd give this place a 9. If and when I come back to Sozopol(which is an awesome town), I know exactly where I'll be staying.